Two more women come forward to accuse Roy Moore of misconduct. Republican candidate for U.S. Senate Judge Roy Moore speaks during a campaign event on November 14, 2017 in Jackson, Alabama. Another two women came forward Wednesday with personal stories detailing misconduct by Alabama Senate candidate Roy Moore. 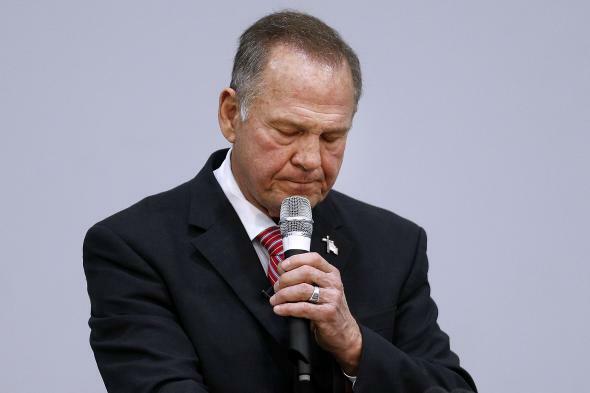 The story published on AL.com comes a day after a lawyer for Moore and his wife served the local Alabama news outlet with a threatening legal notice warning it to abandon its reporting on the former chief justice of the state Supreme Court. The notice was likely an attempt to intimidate the news outlet. It did not appear to work. Kelly Harrison Thorp described meeting Moore in 1982 when she was working at the Red Lobster in Moore’s hometown of Gadsden, Alabama. Moore was in his early thirties at the time and the deputy district attorney for the county. Thorp was a 17-year-old high school senior. Moore came into the Gadsden Red Lobster one day when Thorp was working and she recognized the man who, as a war veteran and lawyer, cut a powerful figure over the small town in northern Alabama. Thorp says Moore asked her out on a date. “I just kind of said, ‘Do you know how old I am?’” Thorp told AL.com. “And he said, ‘Yeah. I go out with girls your age all the time.’” Thorp says she rebuffed Moore, telling him she had a boyfriend before walking away. At one point during the meeting, she said, Moore came around the desk and sat on the front of it, just inches from her. He was so close, she said, she could smell his breath. According to Johnson, he asked questions about her young daughters, including what color eyes they had and if they were as pretty as she was. She said that made her feel uncomfortable, too. Once the papers were signed, she and her mother got up to leave. After her mother walked through the door first, she said, Moore came up behind her. It was at that point, she recalled, he grabbed her buttocks. “He didn’t pinch it; he grabbed it,” said Johnson. She was so surprised she didn’t say anything. She didn’t tell her mother.